Anything-Goes Energy Balls | Ignite Nutrition Inc.
To me, the perfect snack is salty and sweet. 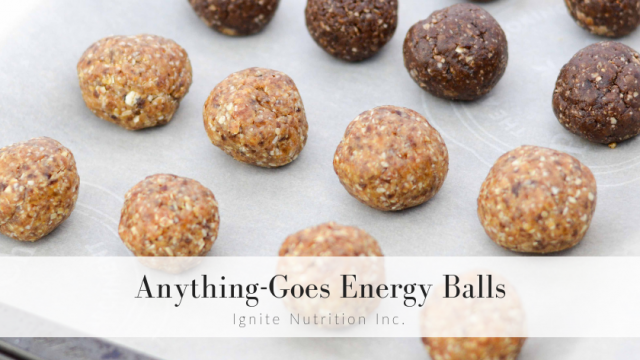 I LOVE energy balls – especially in the summer when I’m busy, and need something quick I can eat on the golf course! We made these energy balls for the Husky Wellness Fair 2018. Additional add-ins, shredded carrots, coconut, chocolate chips or cocoa, hemp, flax, other dried fruit, apple. Spices like cinnamon, nutmeg, ginger, Chinese 5 spice, can add interesting flavours to your energy balls. Blend in food processor, and roll into balls. 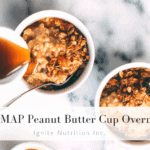 Keep in a container in the fridge and grab and go in the morning! 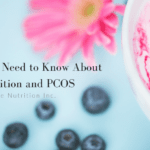 Great to pair with a yogurt in the morning! 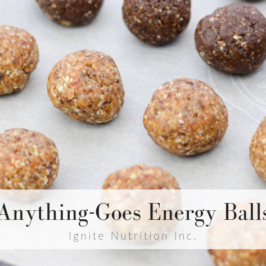 Energy balls are SO versatile. You can make apple cinnamon, carrot cake, cinnamon bun, chocolate, the list goes on and on! All you have to do is swap ingredients in similar ratios (really, it’s hard to screw up – not sticky enough? add more fruit, honey or maple syrup). Too sticky or wet? add more oats. Ta da!